For the month of October we will be improving our gymnastic techniques. Today we were climbing, travelling/balancing on benches and carrying out pencil rolls. It was great fun trying out the different techniques. Today the teachers and 6th class participated in a Tug of War Challenge! Who was the fittest, fastest and the strongest??! Not to mention the most competitive!!! Today was Team Work Thursday! We participated in the ‘Climb the Heights’ Skipping Challenge. We set a target that the whole school worked together on throughout the day to achieve. 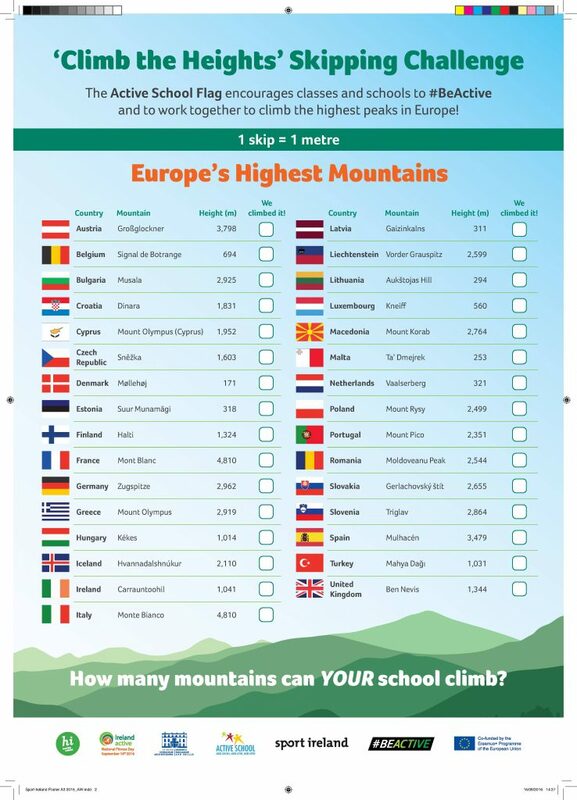 We counted how many skips each pupil completed and then we had a look to see how many of Europe’s mountains our school climbed. We managed to climb most of Europe’s mountains even Monte Bianco in Italy (4,810m) and Mont Blanc (4,810m) !! Below are some of the results.